Vinitaly International Academy (VIA) welcomes the main Italian associations in the wine industry in support of its educational project. Following the appointment of Italian academic Prof. Attilio Scienza as its Chief Scientist, VIA starts a productive dialogue with Federvini, Unione Italiana Vini (UIV), FederDOC, and FIVI Vignaioli Indipendenti on the trajectories of Italian wine education abroad. On Friday July 13th, 2018, VIA Founder Stevie Kim and VIA Chief Scientist Attilio Scienza met the representatives of the four major institutions in the Italian wine sector, that will form the new VIA’s Institutional Advisory Board. At wine2digital in Verona, Kim and Scienza discussed VIA’s enlarged and reformatted project with FederDOC President Riccardo Ricci Curbastro and Director Cristiana Tirabovi, Federvini Director Ottavio Cagiano, UIV Communications Director Giulio Somma, and FIVI President Matilde Poggi. The associations endorsed VIA’s new directions and commitment to build the international gold standard for Italian wine education as well as the so-called VIA Ecosystem, the educational and administrative infrastructure that will engage not only wineries and professionals from all over the world, but also the Italian wine world at large, with local bodies like consortiums. VIA’s Institutional Advisory Board members will act as the institutional guarantors of the project and will help enhance the connections between the sector in Italy and international trade professionals that come to Italy to learn more about its wines. 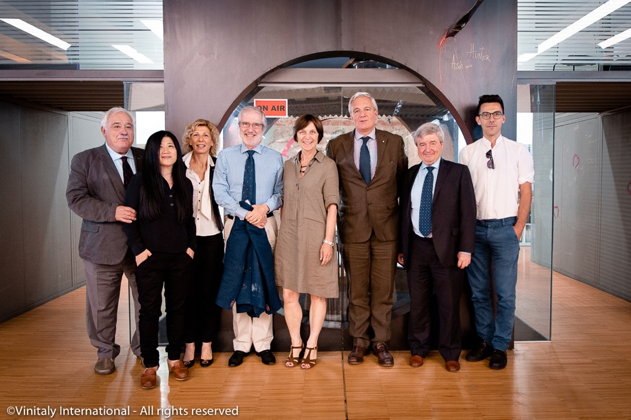 Left to right: Prof. Attilio Scienza (Chief Scientist, Vinitaly International Academy); Stevie Kim (Founder of VIA); Cristiana Tirabovi (Director, FederDOC); Ottavio Cagiano (Director, Federvini); Matilde Poggi (President, FIVI); Riccardo Ricci Curbastro (President, FederDOC); Giulio Somma (Communications Director, UIV); Tommaso Iori (FIVI). In the Italian wine sector, the four institutions that will collaborate with VIA oversee the interests of wineries and of wine production in Italy. FederDOC (Confederazione Nazionale Consorzi Volontari per la tutela delle denominazioni dei vini italiani) is the national association that groups together wine consortiums and that looks after the certification of territory-specific appellations. Federvini is the industrial association bringing under its tutelage larger producers of wine, spirits, vinegar, and other wine-related products. UIV (Unione Italiana Vini) is a category-specific association of winery owners instituted in 1895 that combines all the various companies pertaining to the sector (individual wine growers, more structured wineries, wine cooperatives and industries). FIVI (Federazione Italiana Vignaioli Indipendenti) is the association that lobbies at national and European level to safeguard independent wine growers. The next VIA Certification Course will take place in Hong Kong from November 4th to 8th, prior to the Hong Kong International Wine & Spirits Fair. It will be taught by new Faculty members Sarah Heller MW and Henry Davar. The application form and additional information are available here: https://www.vinitalyinternational.com/?page_id=1785.